In March of this year, Deborah at Circadian Reflections posted some beautiful photos of hummingbirds she took in Santa Cruz. One photo in particular looked like excellent inspiration for a watercolour painting, so I asked her if she was thinking of painting it. She did paint it and posted it for last month’s Draw A Bird Day. She deftly captured the delicateness and vibrant greens of the bird. While she was working on her bird, she suggested I try to paint a watercolour of one of my hummingbird photos too. I purchased watercolour paints in January and took some painting lessons but found the paints and brushes hard to work with, so I’ve been quite reticent to paint a bird. The drawing above is made with pen and ink and Crayola markers. It is a study for a future painting. I used a Staedtler pigment liner 0.1. When I used Crayola Markers on top of Pigma Micron pen lines, the ink spread – I guess they are ok for water based markers but not alcohol based ones. Recently, I purchased a pad of Pentalic 110 lb Paper for Pens. The paper is very smooth and is great for making smooth ink lines. My only issue with it is how much effort it takes to brush off eraser bits; they really stick to that paper! I’ve also tried watercolour paints on this paper. It is ok if you don’t apply much water in one spot and if you don’t rub the paper too much with a brush. So, I’m going to avoid it for painting in the future. I did paint my first bird ever last week. 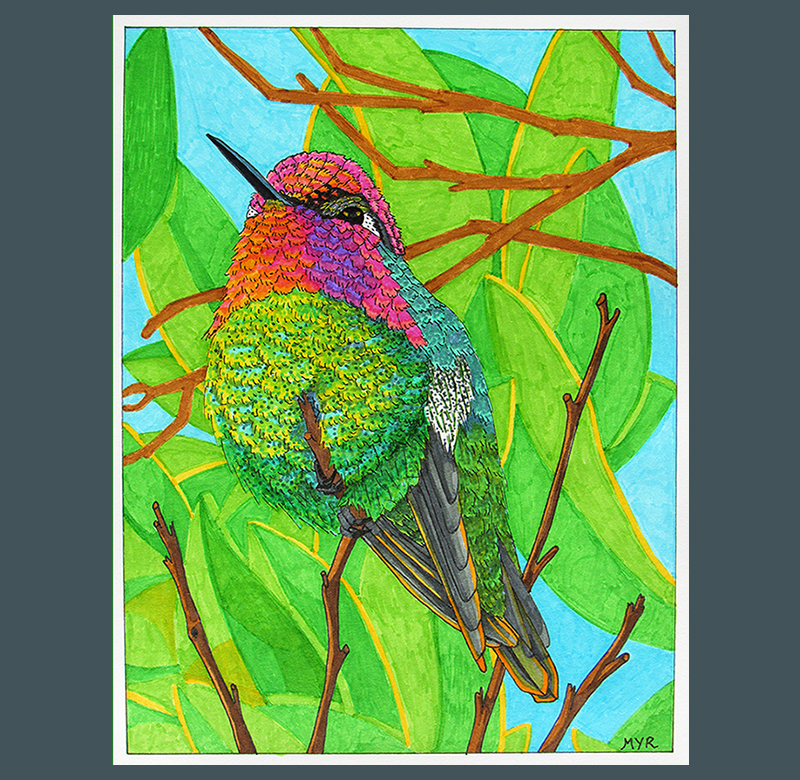 I chose one with less colours and feather details than a hummingbird. It is awesome for a first painting but not quite satisfactory, so I may post it a bit later, once I’ve painted it again once or twice. If you want to participate in Draw-A-Bird-Day or check out other bird drawings, head on down to Create Art Everyday! Thanks Laura for hosting this event! Oh my gosh! It’s stunning! I love the vibrant colors, and wonderful details! The wings and tail feathers are really neat, and the gorget is amazing!! Wow! Really great work. I can’t wait to see your painted bird. Thanks for your lovely compliments, Deborah :-). And thanks so much for the idea and encouragement. It’s beautiful, Myriam! You may have made the hummer even more brilliant and gorgeous than it is in real life! Thanks, Teresa :-). I took the liberty of making his colours a touch more psychadelic :-D. I love your Palila. Beautiful work with the Winsor and Newton watercolour markers – such nice colours, shading and I very much like your little lines for suggesting feather details. Spectacular! Hummers are so inspirational and you have done a fantastic job!! Thanks, Susan :-)!!! Yes, I was quite happy staring at a hummingbird photo for a few hours and exploring his lovely feathers. Take my breath away! Amazing myr! I am blown away! Wowwww!! Thanks for your marvelously enthusiastic compliment, Jodi :-)!!! Myriam, your work is stunning! Seriously, I am continually amazed by what you produce! I can’t believe you did this with Crayola markers. I’m like whaaaaaaaa?! You rock, lady! Thanks so much, Laura :-). I’m so glad we can amaze and inspire each other! Thanks for your lovely compliment, Carol :-). And thanks for your words of wisdom and support regarding watercolour painting. Keep at it! And I very much appreciate the inspiration of your painting. Thanks for the lovely compliment and heart eyes, Charlie :-)! Bright markers make me feel like I’m playing. No idea how I missed this on the 8th. It’s stunning! Miriam. I love the vibrancy and texture in your drawing. Very nice. I love love love this drawing, Myriam! It is gorgeous.